a. The components and processes of Earth's climate system are subject to the same physical laws as the rest of the Universe. Therefore, the behavior of the climate system can be understood and predicted through careful, systematic study. b. Environmental observations are the foundation for understanding the climate system. From the bottom of the ocean to the surface of the Sun, instruments on weather stations, buoys, satellites, and other platforms collect climate data. To learn about past climates, scientists use natural records, such as tree rings, ice cores, and sedimentary layers. Historical observations, such as native knowledge and personal journals, also document past climate change. c. Observations, experiments, and theory are used to construct and refine computer models that represent the climate system and make predictions about its future behavior. Results from these models lead to better understanding of the linkages between the atmosphere-ocean system and climate conditions and inspire more observations and experiments. Over time, this iterative process will result in more reliable projections of future climate conditions. d. Our understanding of climate differs in important ways from our understanding of weather. Climate scientists' ability to predict climate patterns months, years, or decades into the future is constrained by different limitations than those faced by meteorologists in forecasting weather days to weeks into the future. e. Scientists have conducted extensive research on the fundamental characteristics of the climate system and their understanding will continue to improve. Current climate change projections are reliable enough to help humans evaluate potential decisions and actions in response to climate change. Students working with a research scientist to launch a balloon carrying an instrument package for BAMEX, Bow Echo and MCV Experiment. climate literacy addresses the essential question of how we go about studying and understanding the climate system. Climate science follows the same methods and principles of all scientific research, and is based on asking questions, making observations, testing ideas, interpreting data, peer review, and communication of findings. The process of science has demonstrated its reliability over the course of hundreds of years, and it has brought benefits to all aspects of human society. Because of its policy implications, climate science tends to be challenged more than other types of science. But that does not refute the overwhelming amount of scientific knowledge we have gained on this topic. Studies repeatedly show that climate researchers virtually all agree that human activities are altering the climate system. Nonetheless, some portion of the general public is under the impression that scientists are still debating whether or not humans are changing the climate. In fact, climate science is one of the most rigorous examples of scientific inquiry, practiced over several decades by scientists all over the world, and from multiple scientific disciplines. As this research expands our understanding, Its basic findings have remained unchanged since the late 1950s. 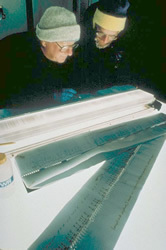 University of Colorado's Mark Meier and Pennsylvania State University's Richard Alley study an ice core from GISP2 (note the annual dust layers visible in this core segment). Photo Credit: Ken Abbott, Office of Public Relations, University of Colorado, Boulder. Data is collected through a wide range of tools and techniques. Data is rigorously checked for quality and accuracy. When scientists use the term "uncertainty," they do not mean that they are unclear in their understanding. Uncertainty is a mathematical term that expresses a range of measured values, rather than one specific pinpoint. Models are a set of mathematical equations that are developed by measuring known processes that operate on Earth. Models are compared to actual observations in a process called calibration. Climate models can reproduce the same variations we see in today's climate, purely by using mathematics. Only once a model is well-calibrated is it used to project future changes in climate. The process of peer review allows for transparency in methods, results, analysis, and conclusions. Data is made available such that any analysis can be repeated by other researchers. Published work is scrutinized by others who are knowledgeable in the details of that topic. Scientists share data, methods, and results with other scientists. Peer reviewed publications are an important part of the scientific research process. Even though these articles are usually very technical and often hard to understand by a non-expert, they still serve as the primary way that climate science is communicated. Scientific agencies such as NOAA, NASA, and the US Geological Survey are public institutions that serve the citizens by studying the Earth. This graphic summarizes the research on the scientific consensus on human-caused global warming. Each of these studies looked at expert opinion of climate scientists who have published peer-reviewed climate research or peer-reviewed climate papers. Image from Skeptical Science. Provenance: Skeptical Science graphic, licensed under a Creative Commons Attribution 3.0 Unported License. An area of common confusion that educators, students, and the public have is that climate scientists disagree as to whether or not climate change is happening, or if it is happening, whether or not humans are the primary cause. There are a variety of reasons for this, but the bottom line is the vast majority of scientists who study climate and publish in peer reviewed journals do agree that human activity is causing the planet to warm. A related area of confusion is that most people don't understand how climate scientists know what they know, which can make the findings harder to appreciate. This is partially because scientists aren't always good at communicating their research to non-technical audiences, and partially due to the way science is communicated in the media. Another hurdle is the perception that understanding science is overly challenging. Here, educators can take active steps to engage students in science. Students will experience for themselves that science can be fun, intuitive to understand, and relevant to everyday life. The best - and most fun - way to help students relate to the scientific process is to immerse them in it. The process of engaging in science can be accessible to all grade levels and can be brought into the classroom with a variety of approaches. There are countless relevant scientific questions to examine. Whether in teams or as individuals, learners can become immersed in the inquiry process of research, observations, data analysis, synthesis, and presentation that lies at the heart of all robust science. Make measurements of weather: temperature, rainfall, wind, snow, etc. Measure the temperature of different colored surfaces to explore albedo (the reflectiveness) of different materials. 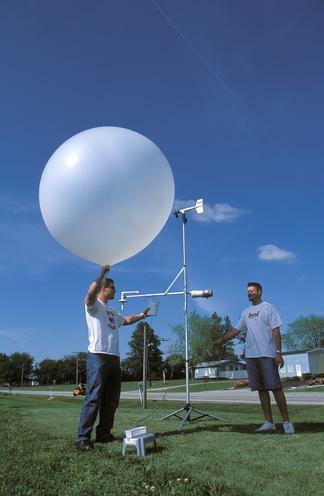 Use local meteorological data to answer questions. Compare local or measured data to other time periods or places. Communicate findings to peers or the community. Another tactic is for students to watch videos of engaging scientists at work. Climate scientists like Richard Alley (Earth: The Operators' Manual) and Katherine Hayhoe (Global Weirding) are masters of communicating climate science in an approachable, engaging style. Using a Very, Very Simple Climate Model in the Classroom - Through a simple online model, students learn about the relationship between these and learn about climate modeling while predicting temperature change over the 21st century. In the Global Climate Change and Sea Level Rise activity, students will practice the steps involved in a scientific investigation as they learn why ice formations on land (and not those on water) will cause a rise in sea level upon melting. 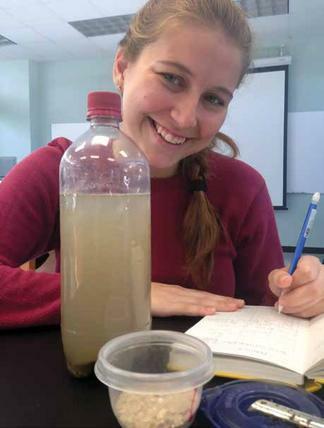 Evidence of Ice-Free Seas and Reading Antarctica's Rock Cores are fun, hands-on activities where students make sediment cores and learn about past climate history. Students take part in hands-on data collection as they learn about Arctic science in the Arctic Climate Curriculum. This is a three-part suite of activities. Students can examine data from a widespread area to see if national data matches up with their own observations of their local climate. See the US Historical Climate: Excel Statistical. The video How Do Ice Cores Allow Researchers to Look at Global Change? features a PhD student explaining some of the methods of her work. Another video, Fastest Glacier portrays scientists studying the rapid retreat of the the Jakobshavn glacier in western Greenland. Whither Arctic Sea Ice? - This case study has students working side-by-side with a scientist from the National Snow and Ice Data Center and an Inuit community in Manitoba. Students learn how to use aerial photographs to assess the impact of extreme weather events in Aerial Photography and Mapping Lesson Plan: Images of Katrina. Over 50 datasets of various Earth processes are stunningly displayed in NOAA's View Data Exploration Tool. This data viewing tool is highly engaging. Users select from atmosphere, ocean, land, cryosphere, and climate, and drill down from there into more detailed categories. Many activities from Earth Exploration Toolbook ADD LINK feature authentic data and analysis, such as Investigating Climate Change Using Observed Temperature Data. From Isotopes to Temperature: Working With A Temperature Equation - Oxygen isotopes of corals are a fundamentally important tool for reconstructing past climates. Students can try it themselves in this activity. Robert MacKay has written many excellent activities for learning about climate and climate models. This one, Mass Balance Model, offers a good way to jump into this topic. It could be followed up with Using a mass balance model to understand carbon dioxide and its connection to global warming. Working with large datasets is a key research skill. The Global Temperatures activity offers a way for students to look at global temperatures dating back to 1867. The Real Process of Science is an updated, realistic replacement for the cookbook-style "scientific method." This interactive graphic from Berkeley highlights the cyclic process of scientific inquiry and advancement. Process of Science - This web resource from VisionLearning contains 16 modules describing various aspects of scientific inquiry, data analysis, peer review, ethics and more. 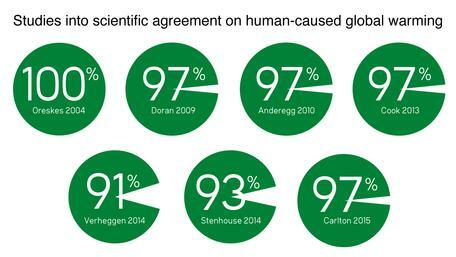 The 97% consensus on global warming from Skeptical Science offers a summary of research that measures the amount of agreement in the climate science community.